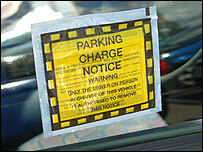 From October, companies that issue parking tickets on private land will have to stick to a new code of practice. But motorists who say they have been unfairly treated are not impressed to discover the code was drawn up with the help of a company at the heart of their concerns. When Eddie Johnson pulled up outside his local leisure centre in Middlesbrough last February he had no reason to suspect he had driven into trouble. He had parked his car properly within the marked bays set aside for visitors to the JJB Sports Centre. He could leave his car there free of charge for up to four hours as long as he was using the facilities. So he was horrified when, on returning to his car, he found a £40 parking ticket stuck to the windscreen. "I'd been swimming and I showed the parking attendant my swimming trunks which were dripping wet and my damp towel and he said we thought we saw you walking off site. 'Look,' he said, 'I advise you to appeal'." But Mr Johnson's appeal came to nothing. 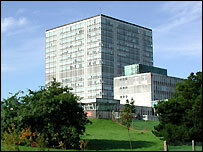 Excel Parking Services Ltd, which is based in Sheffield, did not cancel the ticket even after Mr Johnson sent in swipe card records from the leisure centre. They showed he had entered the complex shortly before he was supposedly seen walking away from the site. He has refused to pay, so letters from debt collectors have followed with escalating costs - now up to £239. "It's outside the spirit of fairness," says Mr Johnson. The code of practice being introduced by the British Parking Association (BPA) states that operators should provide a "proper and adequate Disputes Resolution Procedure" that operates in a "fair and reasonable manner". It talks of companies resolving complaints "quickly and amicably". 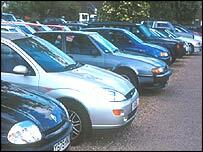 But motorists spoken to by the BBC say that has not been their experience in dealing with Excel Parking Services. One woman told us she received a demand for £100 two years after an alleged parking contravention in Surrey. Another told how her daughter had failed to get a ticket cancelled even though as an employee working at a retail park in Bradford she was entitled to park for free. (Excel says she wasn't on the approved staff list so the ticket stands). Others have expressed dismay at Excel's premium rate phone line, printed on the back of tickets, which costs 50p per minute to call. There is a cheaper landline number also printed on tickets - but that is for "payments only". Another landline number for the company can be found on its website. The BPA's code of practice has been produced in response to a government announcement that only companies belonging to an accredited trade association with an enforceable code of conduct will be allowed access to the Driver and Vehicle Licensing Agency (DVLA)'s database. This is vital to private parking companies - without access to motorists' names and addresses they would not be able to chase up unpaid tickets. The BPA is the only accredited trade body for private parking companies. So if members do not comply with its code, they could ultimately be ejected from the BPA and lose access to the DVLA computer. The code does introduce new standards. But what motorists, unhappy with their treatment by Excel Parking Services, find ironic is that the company's managing director, Simon Renshaw-Smith, helped draw up the code. He has denied that motorists have been treated unfairly, saying his company is compliant with the code of practice and does accommodate all appeals. "The length of time that it has taken on numerous occasions isn't always as efficient as we would like. "However, we've invested heavily in the systems within our business to try and run more efficiently and that is exactly what we're doing. "We are never going to be liked for issuing parking tickets, but those people have contravened in the first place. If they didn't contravene we wouldn't issue a ticket." Mr Renshaw-Smith says he has been striving to have codes of practice put in place for parking enforcement for 17 years. He says the premium rate number is to deter people from calling, as Excel can only accept appeals in writing and that is a national standard. A report will also be broadcast on BBC Radio 4's Face the Facts at 1230 BST on Friday 10 August, repeated at 2100 BST on Sunday 12 August.